A few weeks ago I wrote about the effects of net drive 5v5 so now it’s time to cover special teams which in an era of declining power plays, now makes up about 23% of total offense. Strong special teams are pretty much wasted on those with a weak even strength game but for teams that do and get home ice advantage in the playoffs as a result, strong special teams is finishing school. The biggest driver for robust special teams is opportunity; first by generating surplus (PP-PK) power play minutes and the best way to do that is to be first on pucks at even strength. Over the last five 82 game seasons, 75% of home teams generated surplus power play minutes and as a result, averaged 16% more power play goals at home in a given year than they did on the road. Next up is maintaining surplus power play minutes on the road; and by that I mean maintaining a shallow grave and going from there. Considering we’re talking about a 23% slice of the offensive pie, a look at the best surplus road teams in a given year typically reveals a mixed bag of good even strength teams and some very, very bad ones. With home teams getting the majority of surplus power play minutes every year, the only option for visiting teams is a combination of discipline and being first on pucks without last change. To better gauge the Canadiens, it’s important to first identify the league averages and so far this season, teams are averaging 7 unblocked shot attempts per game on the power play; 37.6% of them coming within 25 feet but generating 63.4% of all power play goals scored. That translates to teams shooting 19.6% in-close and 7.4% beyond 25 feet, both of which are higher numbers than at 5v5, which is understandable. As for rebound control and puck clearance, 19.6% of all power play goals scored came within three seconds of an initial save, up about 2% over 5v5 play, which comes as a bit of a surprise. Last season, the Habs allowed 5.8 unblocked shot attempts per game on the PK but a disturbing 48.7% of them came within 25 feet. Fewer attempts surrendered than the league average but far too many of them coming in-close. 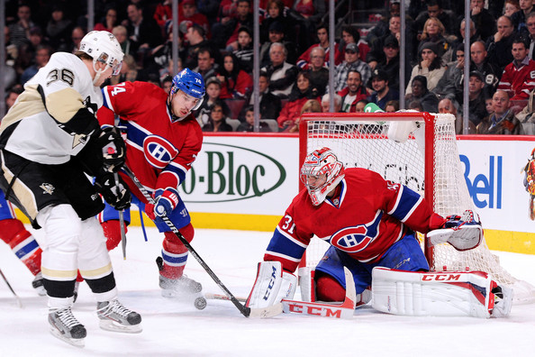 The result was opponents shooting 24.5% on the Habs goaltenders! Another telling number for me was rebound control; just 11.8% of the red-zone (within 25 feet) power play goals against came within three seconds of a save. To me, that means Price and Budaj were being beaten clean beyond the crease more than as a result of defensemen losing crease battles for position and rebounds. Had the Habs not led the league in surplus power play minutes last season, their 23rd ranked PK would have buried their special teams. Instead, with short-handed goals accounted for, they finished +5 in power play goal differential which tied them for 6th best in the East. So, how are the Habs faring this season? At first glance, they enter game 25 vs. Buffalo with the 4th best PP%, 13th best PK% and ranked 12th in surplus power play minutes. On the power play, they’re averaging 7.7 unblocked shot attempts per game so far, which is .7 above the league average and 1.3 more than their opposition. Of those shot attempts, 38.3% are coming within 25 feet which is also above average. Impressively, the Habs power play is shooting 25.9% in the red zone while opponents are shooting 21.8%, slightly above the league average of 19.6%. All in, the Canadiens are +2 in PP goals within 25 feet, +4 beyond and with short-handed goals accounted for; their specials teams are first in the East at +9. On the surface, things look pretty good but there are some concerns. First off, the Habs have only played 10 road games and three of the next five are on the road. That should mean fewer power play minutes and a PK that’s about to get tested. What’s especially concerning is that 47% of opponent power play shot attempts are coming within 25 feet. Just like last year, that number is way, way too high but so far, they’ve gotten away with it. Carey Price has done a fantastic job making initial saves and limiting rebounds on the PK but he’s also only played in 5 of 10 road games where opponents get more opportunities and more chances. Budaj has been great on the road but unless they find a way to keep power play shooters to the outside more than they have, it’s a dam in danger of breaking; just at a time when the Habs appear to be finally turning the corner on their even strength scoring woes. Needless to say, the timing for Emelin’s return couldn’t have been better and with Therrien easing him back onto the PK, hopefully we’ll see a drop in those red-zone chances against.